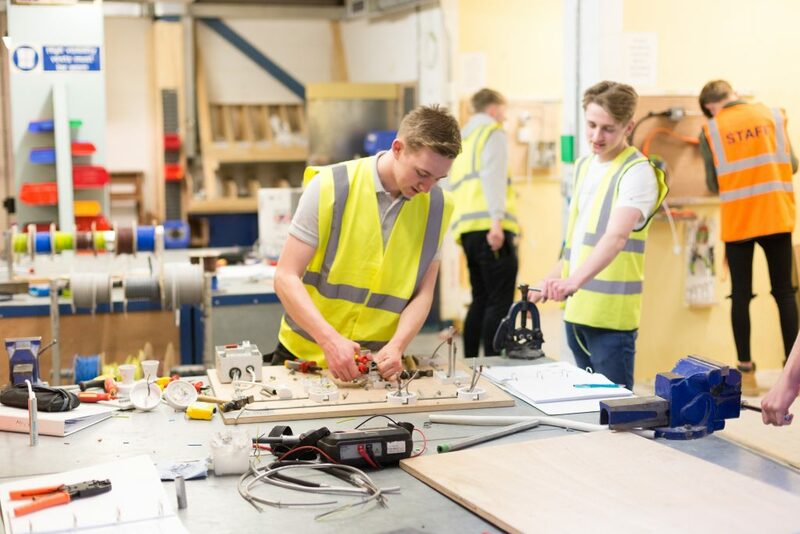 Bridgwater & Taunton College works with employers, industry specialists, community organisations and awarding bodies to develop and deliver innovative, accredited and bespoke Apprenticeships required by business. The strong Government focus on Apprenticeships, coupled with the introduction of the Apprenticeship Levy in May 2017, means that it makes good business and financial sense to consider an Apprenticeship as a way of producing ‘home-grown’ talent. An Apprentice might be a new recruit, but they might equally be an existing member of staff you’d like to upskill or retrain, perhaps to increase productivity, meet legislative requirements or because the focus of the business has changed. We offer a range of Apprenticeships in all main industry sectors, from Level two through to degree level programmes. We adopt a partnership approach, working with you to find the Apprenticeship programme that best meets your training needs, and we also offer a fully-managed Apprenticeship service to help you maximise Apprenticeship opportunities within your business, whatever its size. In addition to managing the Apprenticeship programme itself we also offer a free-of-charge recruitment service that covers promotional activity, vacancy management, candidate sifting, initial assessment, interviews and candidate feedback – we tailor our support according to your needs and the time you wish to spend on recruitment. Call 01278 655111 or email business@btc.ac.uk to find out more. Alternatively, click here to find out about Degree or Higher Apprenticeships for Employers on the Government website. Traineeships are free programmes, ideal for people who want to improve their chances of gaining an Apprenticeship or employment, but who need a little extra support for progression. Traineeships are unpaid and can last from six weeks to a maximum of six months, with the content tailored to meet business organisational needs. Work placements – Trainees gain an insight into and experience the world of work. Work placements help to identify potential candidates who could fit well with a business’ company culture and have the potential to make a valuable longer term contribution. Preparation Training – We work with trainees to ensure they are ready and confident to take their first steps when they join a business on a Traineeship. Maths and English – We support trainees to ensure they have the required literacy and numeracy skills. At the end of the programme, an employer will be requested to provide a reference for the trainee, and if appropriate, either a mock interview or an interview for a post within the organisation. We request that all trainees show a clear commitment to the programme and to their work placement employer, and in return we would ask employers to provide opportunities to help support progression and to consider trainees as potential future employees. Must be keen, enthusiastic, reliable, and ready and eager to start a career. Must be aged 16 to 24 and qualified below Level 3. Must have been resident in the EU for the past three years (and have proof of this). Will not be currently working and will have little work experience, but are focused upon work or the prospect that it offers. For further information on Traineeships, or if you are an employer looking to take part in a Traineeship programme, please contact the Business Development team by emailing business@btc.ac.uk or calling 01278 655111.